Intel has shifted its self-driving car efforts into high gear with a $15.3 billion deal to acquire computer vision and collision-avoidance company MobileEye. With the deal, announced Monday, Intel gets its hands on technology for machine learning, data analysis, localization and mapping for driver assistance systems and autonomous driving. Mobileye develops a full package of software and chips designed for use in autonomous cars. The deal is expected to close in nine months and calls for the combined global autonomous driving organization, which will consist of Mobileye and Intel's Automated Driving Group, to be headquartered in Israel and led by Amnon Shashua, Mobileye's co-Founder, chairman and CTO. The acquisition of MobileEye will be merged with Intel technologies like Xeon processors, FPGAs (field programmable gate arrays), 3D Xpoint memory and 5G modems in autonomous cars said Brian Krzanich, Intel's CEO. Intel wants to get its technology into cars, but has lacked a power-efficient chip and autonomous driving software that could form the central brains of an autonomous car. Mobileye fills that gap, and now the challenge will be to combine Mobileye's technologies with Intel's current product offerings. Intel offers car computers like Go, which are highly customizable with FPGAs, but Mobileye could change the design of its automotive hardware systems. Mobileye is developing a new assisted driving platform with a chip called EyeQ5 -- which has MIPS processors -- that should be in autonomous cars by 2020. Cars are becoming data centers on wheels, Intel says, and it expects that by 2020 self-driving vehicles will generate 4,000GB of data per day. The company estimates that the vehicle systems, data and services market opportunity will be worth up to $70 billion by 2030. 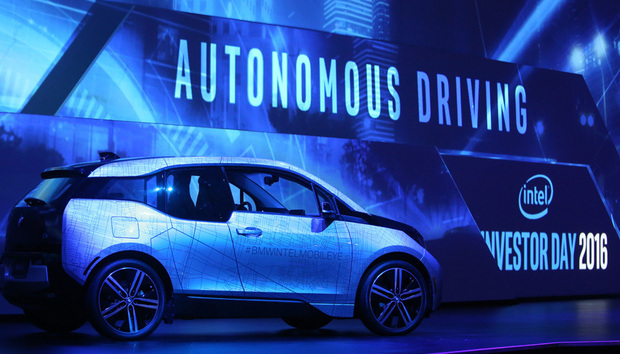 As the PC market cools down, Intel has started chasing the autonomous-car market. Intel had already announced that it will work with BMW Group and Mobileye to build a fleet of about 40 autonomous cars that will hit U.S. and European roads by the second half of 2017. Intel has already acquired a handful of companies developing self-driving car technologies and last year said it would invest US$250 million over the next two years to develop autonomous cars. The combined Intel-Mobileye organization will support both companies' existing production programs and build on relationships with automotive manufacturers, suppliers and semiconductor partners to advanced driving assist, highly autonomous and fully autonomous driving technology, Intel said. Intel may also have to smooth relations with one previous Mobileye customer. Mobileye's assisted driving system was used in cars made by Tesla, which pushed the blame for a series of accidents onto Mobileye. Mobileye denied its technology was responsible, and a war of words with Tesla broke out. The relationship between the companies ended, and Tesla is now developing its own platform for assisted driving.